I had the pleasure of meeting Mary Norsworthy at Girl’s Night at All South Appliance one night. Mary is a director for Pampered Chef and a great cook. Pampered Chef is a wonderful company that offers a line of kitchen tools, food products, cookbooks and more! I had so much fun at GNO learning new food tips and recipes from Mary. 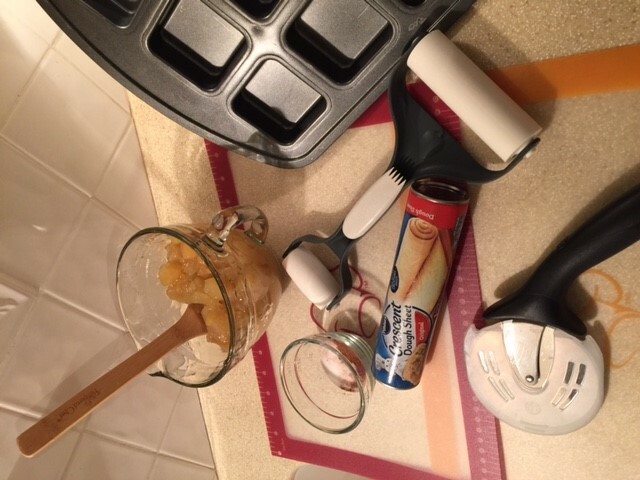 I wanted Mary to share a recipe with my readers because she has such wonderful ideas with Pampered Chef products. Mary is sharing one of her favorite recipes with and it is perfect for fall. I hope you guys enjoy!! This will be perfect for your Sunday dinner tomorrow! Around the age of 12 I became a baker because of my love for sweets. I have probably made a million No Bake Chocolate Oatmeal cookies since then! I started my Pampered Chef business 13 years ago and because of that I enjoy cooking recipes other than sweets! Cooking is an adventure and a therapy for me along with a glass of wine! I would say I’m self-taught and also give credit to Pampered Chef. Having the right tools in the kitchen is a must and makes cooking so much more enjoyable. My mother liked to be in the kitchen by herself but of course allowed me to do the cleanup! What is your favorite thing to make or a great cooking tip? 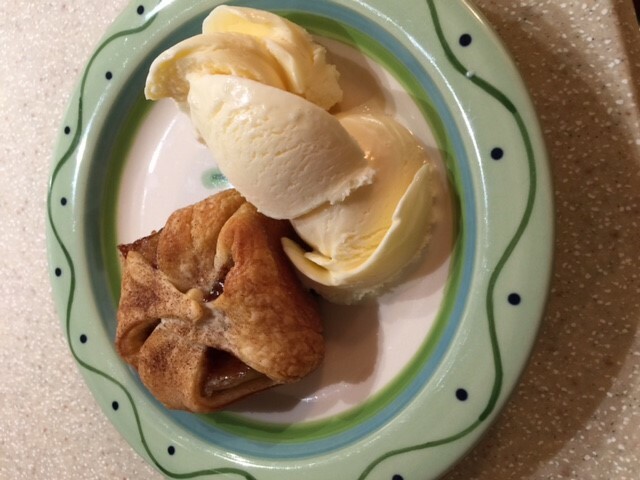 With the fall season, I’ve really enjoyed making “Mini Apple Pies”. Do you have a favorite famous cook/foodie? My favorite foodie is Stephanie Parker of Birmingham, AL aka Plain Chicken. Preheat oven to 350F. Roll out dough to flatten and enlarge dough. 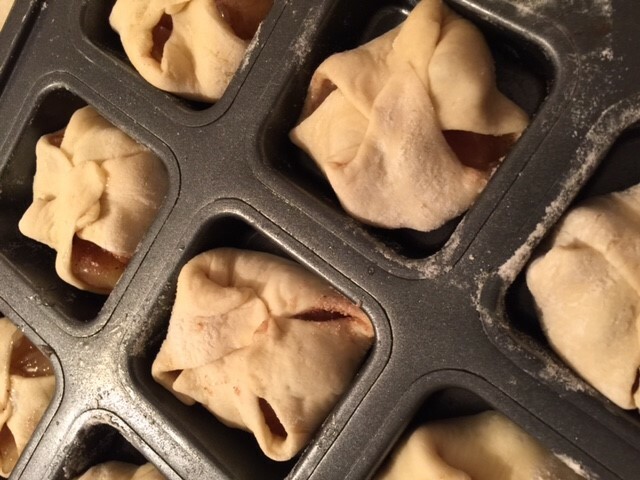 Cut into 12 squares and place dough in a muffin pan. I used Pampered Chef’s Brownie Pan. Allow the dough to drape over the corners. Scoop 2 Tbsp. 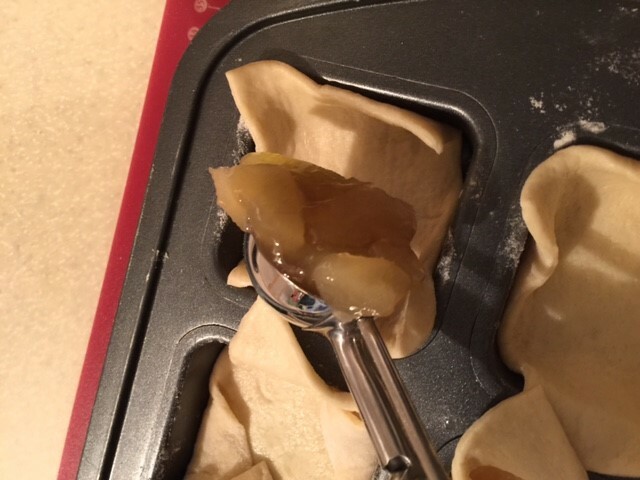 of apple pie filling into each well. In a separate bowl, mix sugar and cinnamon together. Add to the top of each square. 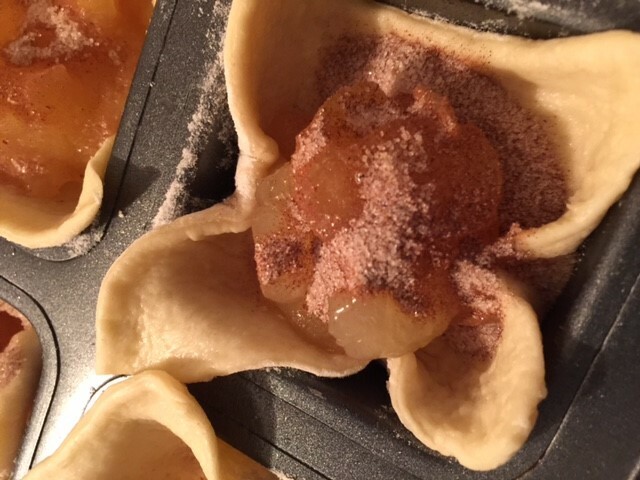 Pull corners to the middle and add another dash of the cinnamon/sugar mixture. Bake 15-17 minutes or until golden brown. Remove from pan immediately and serve with ice cream, if desired!